EDream is collaborating with the local arts festival "Pens To Lens" to provide motion capture animation technology to filmmakers. Students and artists are working with custom software in the labs at NCSA to bring screenplays written by K-12 students to life. AVL/eDream team member Jeff Carpenter created an interactive application for the recent redesign of the The Land between Two Rivers exhibit at the Spurlock Museum on the University of Illinois campus. The exhibit includes artifacts not displayed since before the World Heritage Museum moved to the new location. 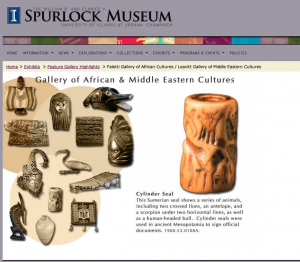 The interactive kiosk contains images and scenes from the various artifacts in the exhibit. Using Photoshop, After Effects and Flash, Carpenter was able to bring the various scenes of gods, monsters and animals to life. Enabling the user to explore the various scenes and characters present on these ancient seals. eDream Institute provided an interactive virtual exhibit at Stage 5 in KCPA as the Krannert Center Student Association celebrated the spirit of the season on Sunday, December 5th in the Krannert Center Lobby. Between the Winter Lights performances, KCPA visitors were able to navigate and spray virtual snow over a Gingerbread wintry scene. eDream hosted an interactive arts-technology experience in Krannert Center for the Performing Arts' Studio Theater in celebration of the 2010-2011 season's opening night. Visitors were invited to play with cutting-edge technologies so cool they're hot! Our five installations were a waterfall made of projected light that responded with sound as visitors moved across its surface; a montage of original 3D high-definition images of Manuel Antonio National Park, Costa Rica that transports visitors south; a virtual tour of Buenos Aires where visitors splashed digital murals on barrio walls; a taste of Deke Weaver's then upcoming performance(September 23-27, The Stock Pavillion, Urbana), Elephant, projected for visitors' pleasure in cinematic splendor; and a 3D sculpture of an illuminated band stand on which visitors triggered Latin percussion. Stuart Levy, Jeff Carpenter, Matt Hall, AJ Christensen, Deke Weaver, Kelly Searsmith, and Donna Cox. Bob Patterson, eDream Associate Director and Senior Advanced Visualization Lab artist-technologist, contributed Ellnora's signature animation with original rock guitar soundtrack. AVL member Alex Betts contributed to the animation. AVL also showed its advanced scientific and digital cultural heritage visualizations at the festival on a state-of-the-art 3D HD panel in the Studio Theater.